Often clad in chest waders, with a Nikon camera around her neck, you’ll almost certainly have spotted volunteer and keen amateur photographer Sally Ann Symis in the river at many of our recent community river cleanups, taking wonderful photographs of volunteers, rubbish and invasive species for this website! 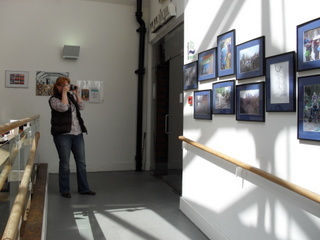 In May, local resident, retired surveyor and fellow keen amateur photographer, John Reeve, happened to be walking by the Wandle at Trewint Street on a cleanup day, and asked Sally Ann if she would like to hold an exhibition of her photographs at the Clocktower Cafe and Gallery in Croydon of which he is an avid supporter. So she selected 16 of her favourite images, framed them, and took them down to be displayed on the entry wall of the Clocktower Cafe. Now, another 16 of her photographs, depicting Trout in the Classroom, invasive species removal and of course cleanups, are being displayed in the cafe/gallery during the month of August. So, if you happen to be in Croydon and want to enjoy a relaxing cappuccino and a slice of cake (almost as delicious as Sally and Jo’s!) head on down to the Clocktower Cafe and have a look at the display. You might even find that there’s a photograph of you! This exhibition is kindly supported by Barratt Homes. This entry was posted in Uncategorized and tagged Events, People, Spreading the Wandle Word, Views from the Wandle, Wandle on August 13, 2012 by Erica.